This compilation of twelve science fiction stories had me hooked at the very first one. 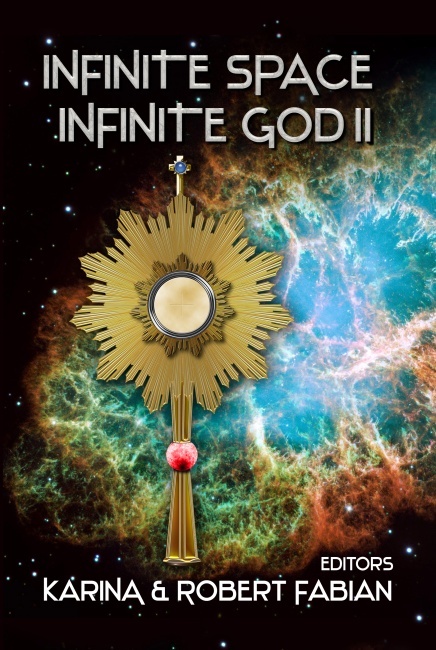 After reading Infinite Space, Infinite God II, I want to read the first book, Infinite Space, Infinite God I. 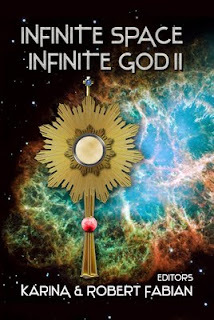 The book’s Christian Catholic flavor serves to enhance the tales, making them moral and causing their futuristic spin to become more exotic. The Ghosts of Kourion by Andrew M. Seddon is outstanding. So much so, that I immediately advised my husband to read it even before I read any of the others. He thought it was great too, and normally he’s not a sci-fi (speculative fiction) fan. This is an exceptionally well-told saga. An archaeologist traveling into the past for study, encounters human emotions in himself he didn’t expect to deal with, and ends up making a difference in the lives of those who went before us. The fact that this story was inspired by an actual 1985 archaeological dig at Kourion, on Cyprus, where the skeleton of a young girl and her mule were uncovered, makes the story even more intriguing. Well written and extremely engaging. Antivenin by Karina Fabian, pg 25. The author has chosen to write about rescue nuns in space, a fascinating concept. These good women go to the aide of a space ship in trouble and encounter a cargo of escaped, venomous snakes within it, endangering their own lives. An Exercise in Logic by Barton Paul Levenson, pg 42. When all reason fails to convince aliens to save thousands of humans on New Canaan, what will convince them? Perhaps the tale of a tail? Tension builds with interesting description. Well worth reading. Cathedral by Tamara Wilhite, pg 57. Genetically enhanced human geniuses suffer an early demise, but bring wealth to those who control them. Katerina learns the drugs she helped produce are addictive and evil, yet she finds a way to undo those wrongs before her death by producing “Cathedral.” Read the story to find out what it is and what it does. A thought provoking, futuristic tale. Otherworld by Karina L. Fabian, pg 67. An interesting voyage into what minds might think and do in a cyber dimension. Take a fascinating trip into a surrealistic cyber world. Does sin really count when it's virtual? The Battle of the Narthex by Alex Lobdell, pg 79. A very tall alien race is baffled by the sameness of “man” on a dozen different planets and quietly studies men on earth, trying to discover the answer. Meanwhile, an old alien soldier is charged with protecting a “small” member of their race who, with make-up to hide his gray skin, can move freely among the earthlings. The two form a special bond of affection, and when the boy’s life is threatened, an amazing “miracle” offers the old soldier a way to protect the young prince. Humor, excitement and futuristic devices will keep you reading to the end. Tenniel by Colleen Drippe, pg 108. A bishop or a savage? This is the story of decisions hard made and hard lived with afterward. A Bishop decides it’s necessary to kill in order to save lives and win converts. Tin Servants by J. Sherer, pg 122. In order to serve his people, Paul becomes an android--but can he really care for them as a tin servant? Basilica by John Rundle, pg 141. Caprizo battles machines and thwarts an enemy armada to keep a doomsday weapon from their hands. Cloned to Kill by Derwin Mak, pg 166. How can a man of peace protect a clone designed to kill? Frankie Phones Home by Karina Fabian, pg 179. A sixteen-year-old alien abductee calls her family on the way back for official First Contact. Dyads by Ken Pick and Alan Loewen, pg 183. Enter the fascinating culture of the Thalendri in a story of intrigue, terrorist and religious tolerance. Thanks so much for posting this review! I'm glad you enjoyed the book, and will pass on your compliments to the authors.